A few months ago I moved into an old farm house in the countryside. It’s pretty huge. It was in good condition – we could move in and live happily ever after, but we had our eyes on some improvements – some nice new flooring, a couple of triple-glazed windows, some sound-proof fencing, a cat. You know, the usual. But the very first thing I bought was this Karcher K5 pressure washer. 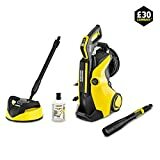 To be honest I’d wanted one for years – I’d never even held a power washer in my hands and lived in a small flat but they just looked so much fun! The K2 seemed a bit underpowered given the variety of situations I wanted it for, while the K7 was maybe too much. I’m not a professional! So I plumped for the K5. It has 145 bar of pressure and spits out 500 litres an hour. Whoo lordy! Ja bitte! I’m very happy with it but in this review I’ll go into more detail. I’ll also keep this updated – I’ve been using it for 3 months so we’ll see if I still like it after a year. It came well packaged – not exactly the same wow factor as buying an iPhone, but pretty good. There was a lot in the box. 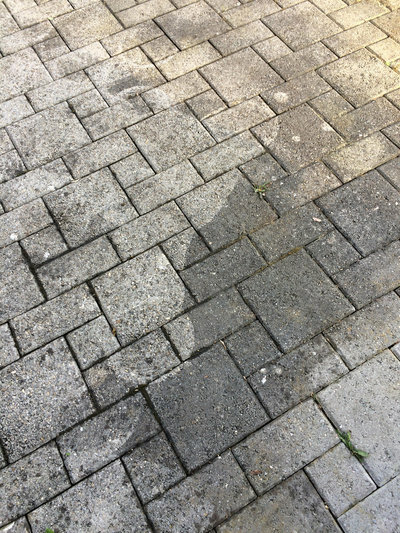 I got a free sample of their ‘stone shampoo’ – I wouldn’t have chosen that one but actually it came in very handy (to clean that very patio you’re looking at). You can see all the standard parts there, plus a special attachment to do floors and walls, and one for unblocking pipes. Setting it up was fairly simple. The K5 doesn’t come with a hose, but luckily my house came with a couple of really long ones. That plus the 8 metre hose on the machine itself means I can reach the whole of my large garden from one tap. Assembly was easy – if I can do it, so can you. One weird thing – the sticker for ‘soft’ and ‘hard’ pressure seems to be the wrong way round on my unit. Curious! Once it was set up and plugged it I had a quick go at using it. It’s FUN. Water BLASTS out. Very satisfying. There are a couple of issues with it that I’ll get into later on. What I think is clear even in that low-quality file is that the dirt comes off pretty easily. 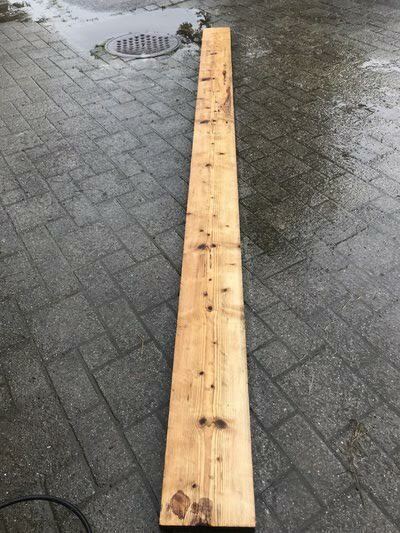 I went over it twice – once from 6 inches away as you can see in the video, and then again but super close to the wood – putting ALL the pressure into one spot. That got it REALLY clean, though of course it took longer. A big reason to buy the K5 was doing the two patio areas we inherited. One was very simple and even I couldn’t mess it up. It looks great now. The other was more complicated – for me, at least. Here’s another terrible photo that shows the project halfway through. Now hopefully you can see there are areas that I’ve cleaned and areas where hundreds of years of grime are still visible. The round bits are from where I tried using the T-racer surface cleaner. The problem is that when you get nice and close to the stone the dirt comes right off, but then you hit the cracks and all the muck that’s built up in there flies everywhere! And the dirty water pooled in some areas by the grass so I couldn’t see if I’d done that or not. It was a glorious mess, I wasn’t properly dressed for it, and I ended up doing it over several days – waiting for yesterday’s work to dry to see which bits still needed doing. That said, now that I know what I’m doing, I could give another area like that a proper clean in one go. The stone detergent was good and it’s easy to use. You plug it into the socket, turn the water to the lowest setting, and it automatically sprays the detergent. Then switch back to the higher settings and it stops mixing it in. Easy! Long story short, our patios are much cleaner now, and don’t give off the same gloomy, foreboding vibe they used to. Progress! 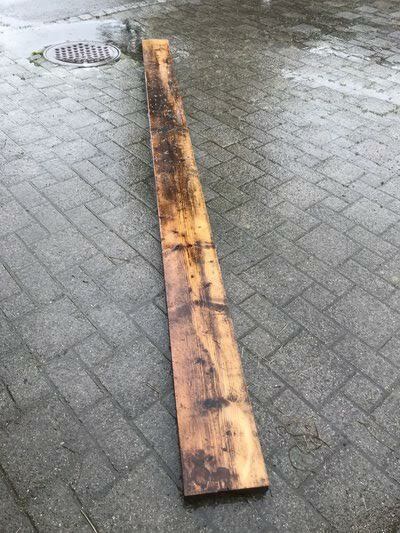 It took me a bit of getting used to the whole pressure washer thing. I definitely made some elementary mistakes at first but soon learned. For example, it’s better to have a plan of attack before you turn on the machine. Excited by my new toy, I just started cleaning the outdoor patio following bits of dirt that I could see. But the next day when the water had evaporated I realised I’d made the problem worse by giving some parts a deep clean and not others. The dirty water splashes around obscuring where you’ve been and where you want to go, so do it methodically, stone by stone in a straight line like you were mowing a lawn. That said, it’s hardly the Karcher’s fault I didn’t know how to use it. My other complaint is also universal to pressure washers. That is, you’ve got the electrical cable, the hose connecting to your water source, and the pressure washer’s own hose. If you go higgledy-piggledy all over the place like me, you’ll end up with a tangle. Another reason to think before you start! It’s also a bit noisy. We’re in the countryside so there’s always a tractor doing this or a truck doing that. In this environment, my little pressure washer is no big deal. But I wouldn’t use it in a terraced street on a quiet Sunday. 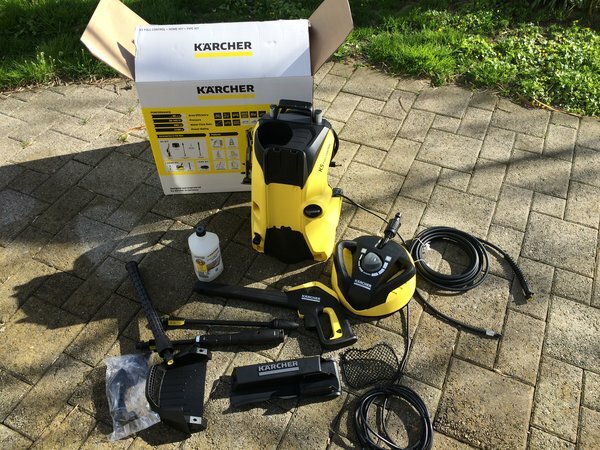 All in all, the Karcher K5 has done everything I wanted it to. It’s cleaned things that haven’t been cleaned in literally decades. Our garden is nicer to look at, the cat can come down and play, and it’s been handy for odd jobs like some spilled paint on our driveway. The price? I think it’s fair. I paid a bit less for an ugly plastic box that holds garden furniture cushions. I paid a bit more for a large parasol. The pressure washer is more fun, has a lot of potential uses, and if times get tough I can start my own car washing business. 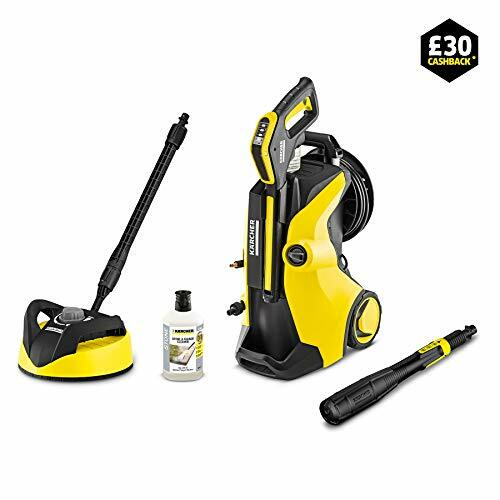 Included accessories: T350 for cleaning large areas of patios & Decking, and a 1L stone & façade detergent.